From I-5 exit I-105 east to Marcola Road. Follow Marcola Road approximately 14 miles. Earnest Bridge is located on Paschelke Road. The Earnest Bridge enjoys the distinction of having appeared in the movie "Shenandoah," filmed in the Mohawk Valley during the mid-1960s. The movie company requested permission from the county to "alter" the bridge to reflect Civil War architecture, and promised to restore the bridge to equal or better condition. The promise was kept, and the span received new siding and paint in 1965. The original covered bridge at this site, an 83-foot structure called the Adams Bridge, was erected by A.N.Striker in 1903. 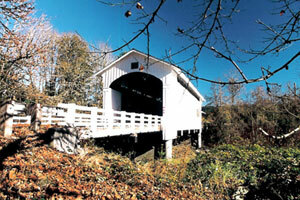 When it was replaced in 1938 by Lane County, the $2,449 cost included $72 for wrecking the old bridge. The new bridge with upper chord dimensions of 12" x 12" x 50 feet and lower dimensions of 12" x 14" x 81.5 feet, was named after longtime residents of the area.